The Warner's bottles are some of the most beautiful and desired bottles. While some bottle collecting books lump Warner's bottles in with Medicines and/or Cures, these bottles are special enough to justify their own category. Warner was originally a safe manufacturer. To help prevent copies of his medicines, he embossed his copyrighted design of a safe on all the Warner's Safe products. 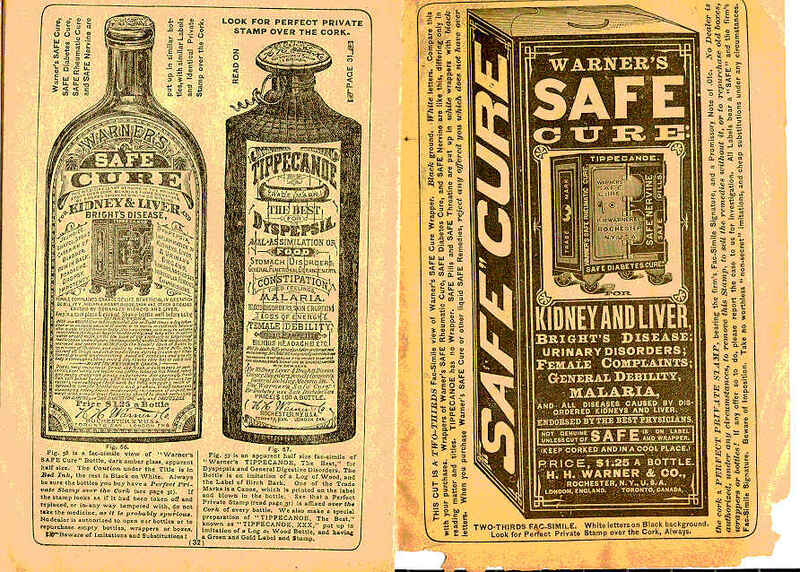 WARNER'S SAFE KIDNEY & LIVER CURE is one of the most common bottles and was only made in Rochester, N.Y. Most of the safes are hinged on the right, but a rarer variant is hinged on the left. H.H. WARNER TIPPECANOE which is a cylindrical bottle with embossed canoe and tree bark. The Tippecanoe bottles were either a Bitters (rare) or Tonic (common) - bottle has to have the original label to tell for sure. 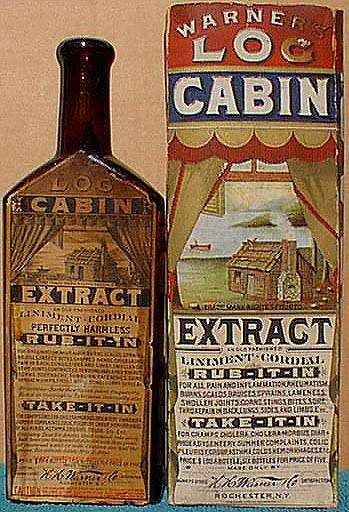 After the Food and Drug Act of 1906, Warner's was forced to change the word "CURE" to "REMEDY". There are also reproductions of the Warner's bottle: check the Reproduction site. Almanac picture showing labeled 1884 Warner's products. Warner's Reference Book by Ed Ojea and Jack Stecher was just released in Feb 1999. The new bible for Warner's bottle collectors that was written by two of the leading Warner's experts. Warner's Safe Cure is a great new site where you can learn more about Warner's Safe bottles. Operated by Mark McDonald, Email: HHWarner@aol.com. Check out his "way cool" Warner's t-shirts for sale. Tippecanoe Bitters article by Mark McDonald, Email: HHWarner@aol.com. Reggie's Antique Warner's bottles and Warner's trade cards.